Once many artists grew bonsai by Tsugiki (grafting). Now the number is decreased and there is concern that the technique will come to an end. At such time, Tadashi Ayada, Ryoshoen bonsai garden in Takamatsu's Kokubunji town, taught the Tsugiki technique to Tadahito Ayada, his eldest son, and Koji Hiramatsu, Shunshoen bonsai garden in the town. Tadashi is an expert who has made Tsugiki for about 30 years. On this day, he taught them how to graft a scion of Janome of Akamatsu (Japanese red pine) to a stock of 2 years old Kuromatsu (Japanese black pine). He says the scion of Janome is long so it is easy for beginners to graft. Teitsugi is a grafting way making a slanting cut by a knife in the edge of root. Takatsugi is a way grafting a scion to the apex of stock which is split by knife and hand. Then fix it with string of rush and it is finished. The trees will be cultivated in pots until next autumn. And then, they will be shipped. 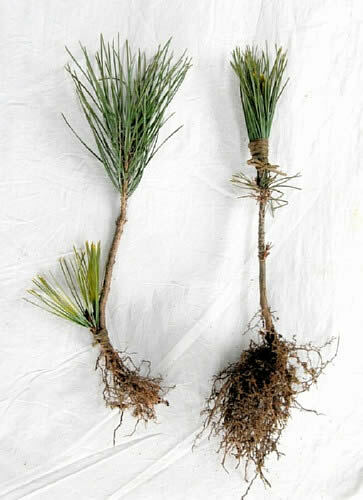 If the trees start rooting, they will have new buds in this May. When it is hard to do Misho (tree grown by seed) and Sashiki (cutting), Tsugiki is used. The good point is the young tree can have the same nature of the parent tree. People expect it will prevent the trees from exhausting in the future. Tadashi does Tsugiki with skillful handling. He is also good at teaching. He says, "Tsugiki for tree is major surgery same as transplant for human. Like human, tree has vital force so it usually goes well surprisingly. Anyway, try it again and again." He teaches the technique to young artists generously. "It is important for bonsai in the future to inherit the technique of Tsugiki which we can cultivate many good trees. Especially the young artists need to understand it." 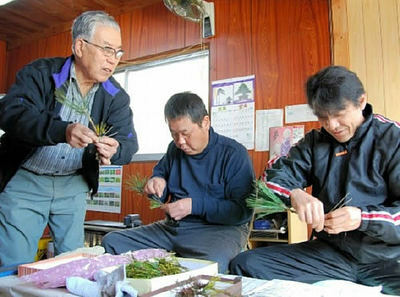 Tadashi Ayada (left) is teaching the technique of Tsugiki to Tadahito Ayada (middle) and Koji Hiramatsu (right) in Ryoshoen bonsai garden in Takamatsu's Kokubunji town. The two artists studied from him did the work one by one carefully. At the end, they came to do it smoothly. Tadahito said, "I had looked at my father's work of Tsugiki, but it was the first time to do it by myself. It was difficult to make an angle of scion." 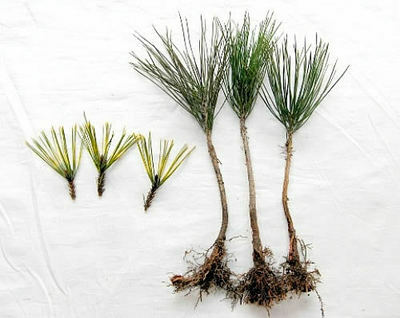 Hiramatsu said, "I was moved with his skillful technique to cut scion and graft it soon. It is very important so I want to be better."